Terry in the office was so helpful. This was my first time on my own ever in my life and it was kind of a scary decision . She was very sweet and understanding. I love my new home so far! Nice apartments and management. Maintenance was completed quickly and thoroughly. Within walking distance of a small market and pet friendly. Alexis, thank you for the review. Our maintenance team is top notch! They take care of your maintenance needs within a 24 hour period. It is nice to have a market down the street to pick up a sandwich, soda, or whatever you need without going to a grocery store! Very convenient. We do love our pets here. Thanks for making Canyon Knox Landing your home! These are the best apartments! Y'all have been so leniant with me and my husband about rent bc of our daughter being due in 5 weeks. Everything is so clean and fun at these apartments. Desiree, thank you for the compliment! We do understand those life events. We try to work with everyone on rent payment to an extent. We do have to follow some guidelines. I am so glad you love it here. We love you being here. Again, thanks for the review and thanks for choosing Canyon Knox Landing as your home for you and your family! Quiet neighborhood located just outside of downtown. Lots of on site amenities, and they are currently in the process of adding a pet grooming area! Madison, thank you for the review. It is peaceful here. We are excited about our new "Paw Spa" that will be opening soon! Plus, pool season is here. You will be relaxing by the pool next week we we open it! Again, thank you for the review. Maintenance is always amazing! And the office staff is very involved in our community! Also they are opening a doggy spa which is so amazing! Cierra, thank you for the review. Our maintenance team is amazing. They are on top of every maintenance issue within a 24 hour period. I am super excited about our Doggy Spa. We are hoping to get to open it by the end of April. Again, thank you for the review and thank for choosing Canyon Knox Landing as your home! Knox Landing is a quiet apartment community with great amenities & helpful, friendly staff. Tabitha and Terry have made me feel at home. It's conveniently located close to restaurante & shopping. I'm enjoying living here. Maria, I am glad you are enjoying living here. We are here for you. Yes, we are conveniently located near shopping and restaurants. Thank you for choosing Canyon Knox Landing as your home! Ryan, I am so glad you love it here. We have some happy long term residents here. We absolutely care about your issues. We resolve them as quickly as possible. We are glad you chose Canyon Knox Landing as your first apartment home! I've lived here for almost 2 years now and I have nothing but positive things to say. The staff are super friendly and helpful. Maintenance is the best I've ever seen and everyone is friendly. The neighborhood is nice and quiet and I've never had a complaint in my apartment that was resolved swiftly. This is one of my first real experiences in an apartment complex and the bar is set high for anywhere I go afterwards. Darien, thanks for setting your bar high. We do strive to be the best we can be and make your apartment living experience awesome. We have a top notch maintenance team that does act swiftly to resolve any maintenance issues you have. I am glad you have been here 2 years. I hope you stay more years to come. Thank you for the great review! Thank you for being our resident for 2 years! Ashley, I am glad you love it here. Our 1 bedrooms are very spacious. We try to hold resident events each month. Let me know how I can make them better and when I can schedule the events so you can attend. Thank you for the review! The community is great! The community is well maintained. All the people I've come across so far are extremely friendly! The staff are always welcoming and willing to help. 10/10 would recommend to people to live here! Ashley, Thank you for the great review and the recommendation. Our residents are by far the friendliest neighbors to have. We are glad you chose Canyon Knox Landing as your new apartment home! It was a nice and easy experience leasing. Everyone in the office was pleasant. Nice area and beautifully landscaped. Great place to call home! . Thank you David! Moving is stressful so we try to make it as easy as possible. I will let our landscapers know that you love the landscaping. We are glad that you chose Canyon Knox Landing as your home! Welcome. The community is very nice. Our neighbors and management are super friendly! The area is very well kept. My favorite apartment, I’ve never felt so welcome! Awesome! I am so glad that this is your favorite apartment home. We welcome everyone who chooses Canyon Knox Landing as their home. We do have friendly residents that stay for years and years to come. We hope you do the same. Thank you for the review. I am glad you love it here. We are glad that you chose Canyon Knox Landing as your new apartment home. We all thank you for the compliment! I love it here! Clean, beautiful apartments with the friendliest and most caring management team around. I highly recommend Knox Lansing to everyone! I am glad you love it here. This is your home. We do care about how you feel about your home. We want people to be happy living here. Thanks for recommending Knox Landing. Thank you for the review! It is a wonderful community to live in. The area is nice and quiet, and the neighbors and staff are friendly. The summertime is the best because the pool is open and we can have little community BBQs. The community BBQs are the best. It is a great way to get to know your neighbors and make new friends. We have a great salt water pool that goes to 8 feet! It is a great way to cool off. 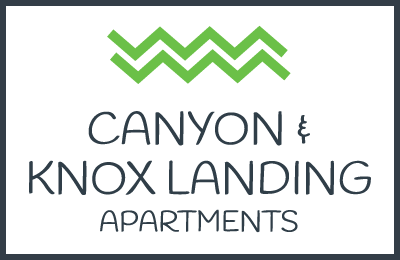 We are great that you have made Canyon Knox Landing your home for the past 2 years. Thank you for the review! Thank you for the review. The trees at Knox Landing make the community beautiful. We strive to be as helpful and respectful to all our residents. The apartments have been updated with a new style shag carpet, abstract looking counter tops in bathroom and kitchen, wood looking vinyl in your hall and bathroom, soft gray color paint on all walls, brush nickel bath light fixture, faucets in kitchen and bath, and ceiling fan in bedroom. Plus we have great amenities like a Bark Park and Fitness Center. We are installing a Dog Wash that should open by end of February. You get all of this and more for the price. The rent is competitive with the area. Again, thank you for the review! I am just moving in but I love it already! The apartment is very nice and I adore the layout. Our landlord even seems so nice! I’m looking forward to staying here! Jessica, Thank you for the review! I am so glad that you love it here! Thank you for the compliment. As I say, kindness goes a long way! I look forward to you staying here! Our resident experience has been remarkable. Anytime we had an issue it was fixed fast and the ladies in the office have been so kind to us. Travis, thanks for the compliment! Our maintenance team is top notch! They are always on top of all maintenance requests within a 24 hour period. Customer service is our #1 strategy here. Kindness goes a long way! Thank you for choosing Canyon Knox Landing as your and your family's apartment home! Tabitha, we are happy that you chose Canyon Knox Landing as your start in a new chapter in your life. Thank you for the compliment! Remember, refer your friends/family or anyone looking for an apartment home and you will get $100 referral fee. Just be sure they list you on how they heard about us! Again, thanks for the review! Pretty solid so far. When we first moved in we wernt sure if the couch you included in the apt would be in the way. We moved it and it cleared up a lot of space so now we have plenty of room. Everything was really clean but, the rip and the burn hole on the couch wasnt recorded on the walk threw and we dont wanna be responsible for it. Besides that great clean place. Wesley, I am glad that you made space in your apartment home. I apologize for the rip and burn hole in the couch. I will note it in your file. We take pride on keeping your community home clean. We are glad you picked our community for your apartment home! Heaven, I am happy that you like it here. On behalf of the entire staff, thank you for the compliment. Yes, the bedrooms are big. That is one of the best features of older communities. I am glad you chose Canyon Knox Landing for your family's home! It's been good so far. My only gripe so far it that it seems to get noisy around midnight. Maybe from people coming in from night-shift? Who knows. Everything else has been good though. Will see how things change as Spring and Summer roll around and more people are out and about. John, thank you for your review. We do have some residents that do work night hours. I will mention in our next newsletter about being more quiet in the late hours. I am glad that you like it here. Thank you for choosing us for your new home.